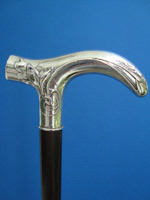 For the past 50 years walking sticks have been growing in popularity as collectors items, for sticks and canes, which actually have no real function, express the social rank of their bearer: the marshal's baton, the sceptre, the bishop's crosier, the judge's staff or an officer's stick. Stick fashion started at the end oft he 17th century. The majority of these early examples had one special basic form. Most famous are the English. They have got a long, powerful knob of ivory or rhinoceros horn, individually decorated with silver nails and inlays of thin silver wires, that show various ornaments in different designs. This technique is called “pique”. 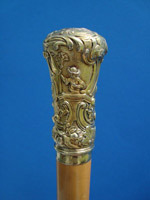 The silver sleeve beneath the handle shows carved grooves and nearly always a fringed rim. At the end of the knob or the handle made of malacca cane there were two eyelets for the hanger or the silver ring. 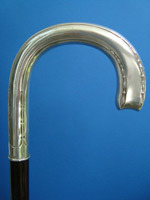 The bottom of the cane consists of a long ferrule to protect the cane against the dirt in the lanes. Figurative handles were the exception in the 17th and 18th century. 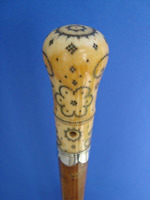 Most time the handles were made of carved ivory or boxwood. In the 18th century the walking stick became one of the most important status symbos and constant companion of the noble gentlemen. 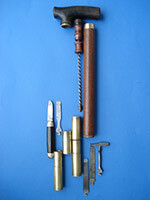 The preferred handle form was the knob or the Tau handle. Louis XIII was the first king, who always carried a walking stick with him. Sticks and canes were given as presents from court to court. The knobs had individual and extravagantly fashioned handles embossed in gold or silver, of gold-overlaid tortoiseshell, of precious stones, amber, jasper or turquoise and so on and were also set with jewels. 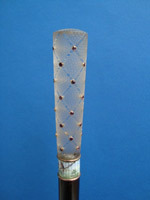 Inlays made of tortoiseshell and mother-of-pearl were also very popular. Painted porcelain knobs and handles formed like a rope with female busts, heads of pugs, lions and other animals were made in Meissen. Such sticks were held beneath the knob to set it off to better effect, a factor foreseen in the extra length of these sticks of 110 to 120 centimetres. The shaft of malacca cane with a long brass or ivory ferrule and two eyelets for the hanger provided the maximum lightness and elasticity. 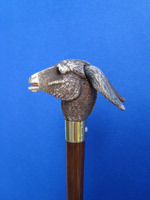 The walking stick became one of the most important accessories. Accordingly big was the selection of walking sticks, that the gentlemen had at their disposal and that they chose corresponding to the respective occasion. In the mid-18th century Saxony's prime minister, Heinrich Graf von Brühl, possessed 300 sticks to go with 300 suits, together with just as many snuffboxes which he weared in turn. 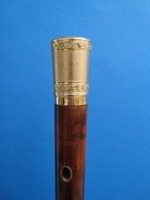 King Friedrich II, too, had a huge collection of luxurious walking sticks and snuffboxes. After the Seven-Years War one particular type of sticks with a handle formed like a rope, which was King Friedrich’s constant companion, became so popular, that it was dubbed the "Fritz crutch". With a stick always in his hand, the gentlemen strolled, discussed and flirted, first in the gardens of the Tuileries, Versailles and Fontainbleau, and later on in the century in the less ordered, semi-wild English-style landscaped grounds and parks. Not to be outdone by the gentlemen and in times, when high heels had become extremely popular and out of enjoyment of fashionable accessories, fashion-conscious ladies also used walking sticks. But while the heels became shorter again and because they had to pay attention to a noble paleness, the women started preferring the parasols again. The French Revolution officially did away with court fashion. For a short time at the beginning of the 19th century sticks became a way of expressing personality, although these sticks were less elegant. One carried it to match one's current mood, which had a strong influence on the shapes of the handles and made the 19th century the flowering of stick culture. The sticks were rarely made of gold and silver anymore, but of sophisticated handiwork. 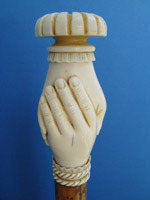 The preferred material was ivory. Ivory handles were carved with illustrations of the animal world, of mythology and of prominent figures, with gods, heroes, skulls, hands - there was no limit to imagination. 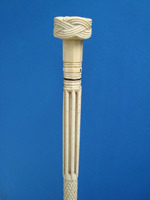 About 1850 a small group of sticks with two new types of handles made of ivory came into being. One was the straight crutch. The other was one with a handle formed like a pistol. This was called “Ziegenhainer” because its form was comparable to the wooden sticks of the students of former times, who came from Ziegenhain next to the city Jena in Germany. A big amount of these handles were carved with the coat of arms and circles of the students fraternity. Special skills in carving were shown by the men who trapped whales between 1840 and 1860. Often they carved beautiful knobs made of whale teeth and shafts made of the vertebras of the whales while being still on sea using simple tools. Rarely they produced canes with shafts of narwhale teeth. Splendourous handles and knobs of high-quality precious stones, gold and enamel, decorated with diamonds and jewels were produced in the Goldsmith of Fabergé at the end of the 19th century. Also at the end of the 19th century the "gadget cane" with additional functions was discovered. Usually not that elegant but curious and unrecognisable from the exterior, the most varied objects and gadgets were concealed in the handle or shaft - out of expediency or just for fun or because the owner of the stick wanted to hide something from the general public. There was no limit to the genius of the inventors. There have been canes assigned to a certain profession: like one to the locksmiths to the doctor or one to the horse trader. With this can the height of a horse could have been measured. This explains the existence and meaning of the word “Stockmaß”. Catherine Dike described 1600 different systems and functionings of canes in her book “Cane Curiosa”. She presents a great variety which reaches from useful canes to witty ones. On the same time have been automatic sticks invented. The handle were formed as a human or an animal head made of ivory or wood. When you press a knob they turn her eyes or her ears and they open their mouth. 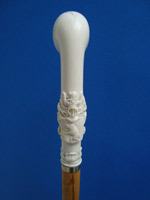 Art Nouveau, too, had a strong influence on stick fashion. The handles were mainly made of silver with figurative portrayals in the form of animals, scantily dressed women and nymphs. Today the tau handles with floral decoration still often serve as an elegant walking aid. At the period of Wilhelm II a new kind of handles, the crook handles, came into fashion. This was the last development in cane fashion. The brief-case, the bicycle and last but not least the car made walking canes not necessary anymore and they have become the new status symbols. Valuable sticks are fortunately almost always still in their original state. Unsuitable as a support and hardly worn out as either a status symbol or fashionable accessory, usually it is only the ferrule, rather like a shoe heel, that is in need of renewal. Traces of usage seldom reduce the value, if they do not affect the optical effect too much; on the contrary, they enhance the charm of the stick, and may even give clues about its former owners and about the way they were used.